My boss always tells me that there shouldn’t be an excuse for failure if you are given the right tools. Getting the right tools is always a problem. Most of the “sets” out there give you the most random items. I recently purchased a C2G Workstation Repair Tool Kit. 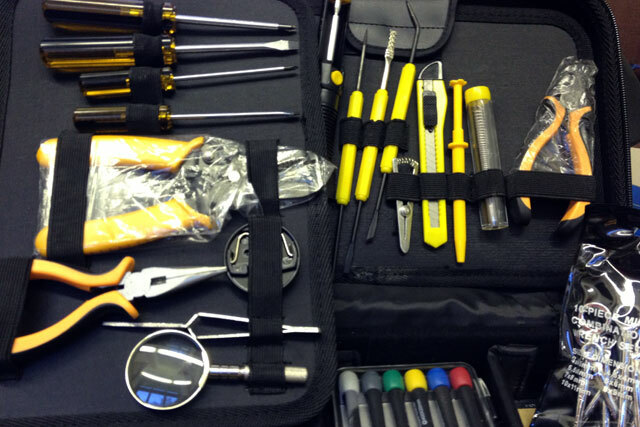 The description of the kit is as follows: Very popular with computer technicians, this kit is designed for a wide range of workstation installations and repairs. It has all the necessary tools for basic repairs on computers and workstations. Maybe this is the “Gotcha!” technique where you’ll still need to purchase more items to complete the sets. Back to this set…there’s a soldering iron in there. I have been a desktop support tech for the past 15 years and I have never used one to repair a workstation. The rest of this set is pretty good because there are really good screwdrivers, wire cutters, etc… There are two downsides to this set that I didn’t like. One was the soldering iron. The second is the micro screwdriver set. It was less than adequate so I ended up adding a better set that I purchased before. I also find this to be the problem in culinary sets. I really hate knife blocks so I created a toolbox just for me. Yes, I keep them in a toolbox because I travel with my tools.